From the sophisticated yet simple opening riff by Paul Chambers on "So What" to Primus' "Mr Krinkle" (a na�ve guilty pleasure of mine) to the relaxed background hums of Larry Taylor on Tom Waits' Bone Machine to the monstrous battering ram of Christian Weber (i.e. Walcheturm Solo), the contrabass is known to impress and has successfully shaken the Classical role of doubling cello lines. For players and listeners alike, the draw of this thing is often just the sheer size � and potential that offers. Berlin-based Alexander Frangenheim's method here flits between two areas: a soloist who can tackle the duties of a larger ensemble; a responder to ghost calls only he can hear (and maybe see). On both sides, he remains agile and delicate no matter how brutal the snap or whack. This musical fencing may be due to Frangenheim's near decade in intense collaboration with hyper-creative, virtuosic dancers such as Julyen Hamilton, Nigel Charnock; his sensitive, nimble grace radiates though his arguably inimitable investigation(s) of extremes of pitch, resonance, amplitude, and / or consuming a room's space like a megalodon. "Talk 1" dives in with the same force as the first passage of Webern's (Op.5 (Five Movements for String Quartet) with a bit more presto. Scrapes and snags and nails across strings meld with short, sinewy melodic gestures and finger taps on wood all executed with free tempi and surprising jumps from fff to ppp and back again. (As noted, there are frequent pauses and dips in sound where one can imagine, say, a trio or quartet playing between the gaps � but these works are most likely more intriguing without the supplement.) Near four minutes, Frangenheim abandons a hammering spasm for five long, plucked reverberating notes that secede to a walking bass with a hint of swing; bow in hand, he switches to an almost-metered series of two string purrs whose intervals start sweet and end harmonically cross-eyed. The ending: hush...bip...tick. This orchestration is the basis of the eleven pieces on Talk for A Listener, but the colors and approach and amount of silence vary throughout. 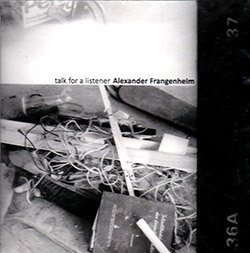 With "Talk 4", Frangenheim incorporates more vigor by way of audible gasps and mumbles (you know, that thing jazz bassists do?) over his furious, raspy bowing. The twelve-minute "Talk 5" features a great deal of contemplation between micro-movements of (bass) body slaps, heated plucks and otherwise relative eruptions. Frangenheim's sporadic bursts of rapidly strummed patterns veer weirdly near Flamenco on "Talk 9", the instrument's bulkiness making a polar bear pool out of a birdbath. Or something.